WE INSTALL YOUR EQUIPMENT FOR YOU! 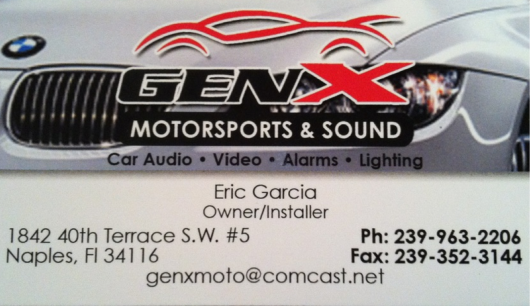 Welcome to Genx Motorsports & Sound! Genx Motorsports & Sound is an auto stereo and accessories retailer in Naples, FL. Our independently owned and operated company has been providing Naples, FL and the surrounding area with premium automobile accessories such as navigation systems, dvd players and flip down video screens. We specialize in car audio, car alarm systems, mobile video, car TV and video, navigation systems and car rear view cameras and are professional installers of all major brands of car stereos and alarms. We excel in meeting and exceeding our customers' expectations. Stop by Genx Motorsports & Sound and see why we are known equally for our quality and service.